This article was originally published at RealClearScience. With so much turmoil going on in the world, it is nice to get some good news for a change. 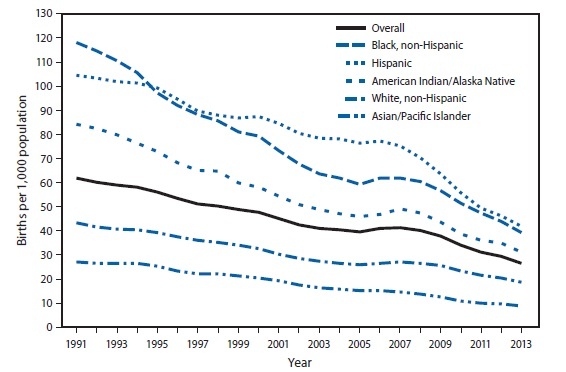 The CDC has reported that teenage (15-19-year-old) birth rates are at historic lows for all races. See graph. However, there is a darker side to this story. Last December, the CDC released teen pregnancy rates for 2009. They were unacceptably high: While fewer than 1 in 20 white teens became pregnant, about 1 in 10 Hispanic teens and more than 1 in 9 black teens became pregnant. Fetal loss was more than twice as common among black and Hispanic teens than among white teens, possibly indicating poorer access to prenatal care. And, more than 1 in 3 black teen pregnancies ended in abortion. So, while it is good news that fewer children are being born to single teen mothers, the data in its totality suggest that there is still much room for improvement. Source: Centers for Disease Control and Prevention. “QuickStats: Birth Rates for Females Aged 15–19 Years, by Race/Ethnicity — National Vital Statistics System, United States, 1991–2013.” MMWR 63 (28): 609.